The top of that slide is a few inches above my head. 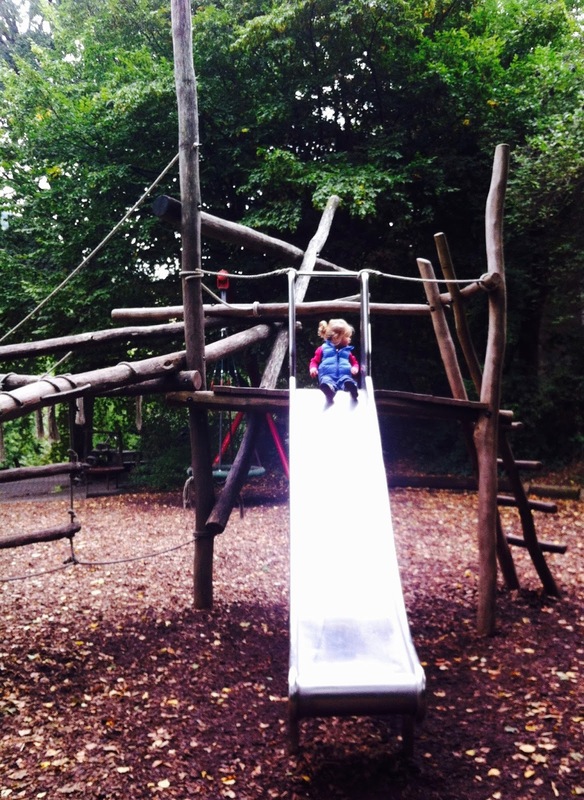 It's a long way down, and there are no barriers of any kind to stop a child from falling. That is, unless you count those decorative ropes as barriers, which I don't. 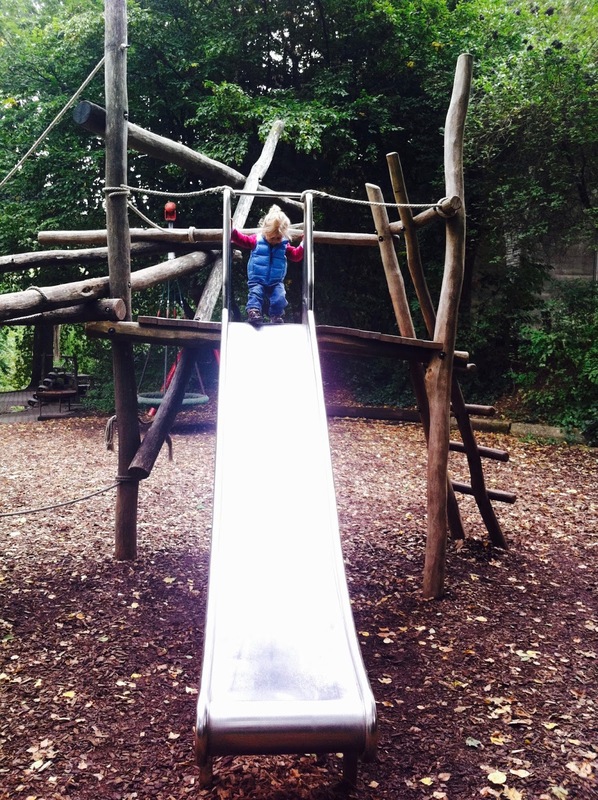 Coco was nine days shy of turning two years old when she climbed up the ladder on the right and toddled cautiously across to the slide, beaming with delight before she slid down. You can understand why last summer, we ourselves were delighted when her swimming teacher said she wasn't ready for the next level (which is typically for 7-10 years olds!) because Coco had a slight fear of the water that she wanted to see conquered first. It was probably the first time that parents were happy their child was afraid of water. But we were; Coco has been absolutely fearless her entire life. 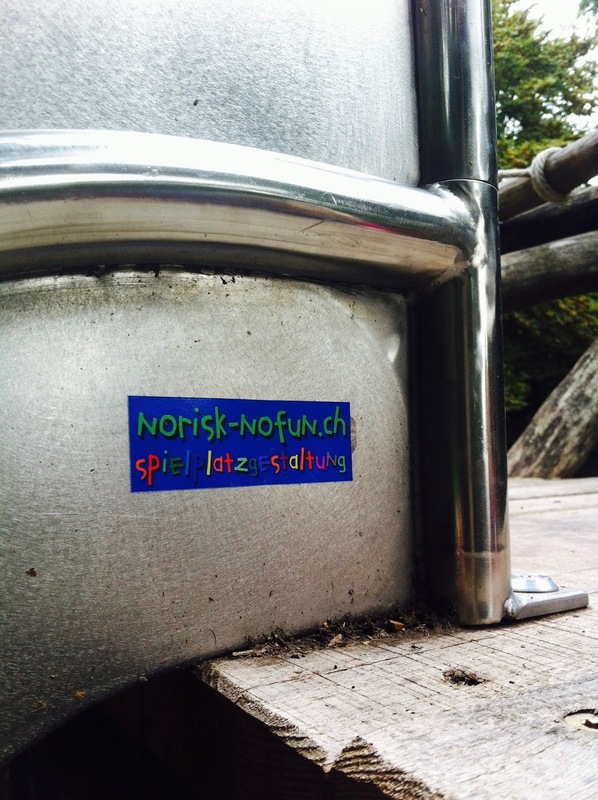 This sticker is on the side of many unconventional playgrounds in Switzerland, such as this one. No risk, no fun is a custom playground design company comprised of three guys who believe that "a playground must contain certain challenges in order to be attractive." They seek to curb newer, safer, and frankly boring playgrounds from going in and instead propose "unique pieces for climbing, rocking, swinging, balancing, jumping, bobbing, wobbling, hiding, splashing, standing, hanging and looking." Doesn't that sound wonderful? Of course as parents, it's our job to keep our children safe. But children need a sense of risk. They are neither satisfied, nor able to acquire balance, strength or physical skills without it. In Montessori, we talk about "perceived risk" because at different ages and stages, and depending on the temperament of the child, what will satisfy their need for risk will differ. Babies may be thrilled by so much as sitting on a chair that fits their proportions and is free of straps and harnesses and sits at ground level. They know that if they lean too far to one side, they will fall right off. And you can be sure that if a baby is sitting on a tiny chair, they probably will fall off because they have to test their limits. It's engrained. The beauty is that it's only a four or five inch fall and they learn without suffering. Toddlers love standing on something close to the ground that isn't solid, such as this Montessori rocking boat. When they climb in, it moves and they have to balance. Toddlers are also fans of climbing everything, including bookshelves, so it's so important to secure furniture! For older preschoolers, like a four-year-old, they're typically challenged and thrilled by a balance beam, a graduated lesson after "Walking on the Line" and a common feature in Montessori classrooms. Last week, I went to pick Coco up at school and she was walking across the balance beam backward with a blindfold on. She is not your typical child when it comes to risk and perceived risk. Risk is hugely important for children. In recent years, there has been a rise in injuries due to parent's trying to be protective on slides. And while we don't have any concrete numbers, it seems to myself and J that a lot more kids are knocking out their front teeth these days than did in previous generations. Of course, accidents will happen, but risk is also key in preventing them; it's how children develop the physical intuition to avoid injury in the first place. Should You Use Cloth Diapers?